It's hard to believe that over 10 years have passed since Metal Gear Solid 4: Guns of the Patriots was released, but Hideo Kojima's epic story was truly groundbreaking and rightfully holds a place as one of the best PS3 games of all time. If you somehow missed it during the previous decade, or just want to experience Solid Snake's journey once again, then there's still time as it was one of the final free PS Plus games on PS3. This guide doesn't reveal the entire brain-bending plot, and the true implications of it are still being discussed to this day, but because you'll find out who you fight and in which locations, consider this an official SPOILER ALERT for the following pages. We'll start out with some basic advice and tips to help you get to grips with the mechanics of MGS4, then move on to step-by-step details for getting through each act and boss fight. In automatic mode Snake’s OctoCamo suit will adapt to mimic the colour and texture of his immediate environment. Team it with the OctoCamo mask (won by defeating Laughing Octopus) and Snake’s camouflage rating can get close to the magic 100%, making him virtually invisible. To change OctoCamo, Snake must be either lying down, or pressed up against the wall or structure you want him to blend into. The OctoCamo suit can also be set to predefined patterns, or to patterns you have saved to its memory. In practice, though, you’re much more likely to leave OctoCamo set to ‘automatic’. In addition to OctoCamo, some of MGS4’s acts give you access to a specific disguise, such as the militia disguise in the Middle East section of the game. Rather than literally hiding Snake, these enable social stealth, freeing him to move around with impunity in certain areas of the game. Weapons launderer Drebin gives you valuable assistance and an interesting dilemma in the game. With nanomachine technology giving guns ‘fingerprint’ access only, Drebin must launder new weapons that you find for a small fee if you want to use them. Doing this also means that Drebin will automatically buy any identical weapons that you subsequently pick up, for Drebin Points that you can then use to buy ammo or specialist, new weapons. However, the amount of money you earn for each weapon depends on the War Economy. It works like this: if you’re employing stealth all the time, there are fewer shootouts and fewer shoot-outs means demand for Drebin’s stock is low, meaning you get less money. However, if you take the shooty approach, demand goes up and you get more DPs to spend on bigger and better guns. So what’s it going to be? Stealth, all-out war, or a little of both? Oh, one more thing. Watch out for Drebin’s occasional sales. It’s not unusual for him to take 20% off rifles, say, for one day only. And be warned, before the final act Drebin has a half-price sale on everything, so it pays to keep those special purchases back until then. In MGS4, Snake’s Stress, Life and Psyche gauges are all linked. The Life gauge is self-explanatory, and can be topped up by Regain energy drinks, rations and noodles. It will also slowly replenish itself if Snake lies low or seeks cover. A valuable bit of knowledge if you find yourself low on rations during a set-piece battle. Taking a day’s break from playing MGS4 will also have an effect, giving you a 20% hike in life force. Psyche is represented by the four-part gauge below the Life gauge and represents Snake’s mental wellbeing. If he’s too hot, too cold, overloaded with kit or feeling his age – because of an aching back from crouching for too long, say – this will affect his Psyche gauge, making it harder for Snake to aim accurately and generally affecting his performance. Removing the problem will help the gauge to replenish itself, as will smoking (although this whittles away at Snake’s Life gauge) and looking at ‘gentleman’s literature’ (which doesn’t appear to make him go blind, Mum). Linked to Psyche is Snake’s stress level. Presented as a percentage, stress increases with sustained combat, unpleasant surroundings and by carrying too much equipment. When stress exceeds 50% Psyche starts dropping so it’s important to try and help Snake chill out when this happens. Combine a high level of stress (80%) with the need to fire a weapon for a sustained period and Snake enters a ‘combat high’. While this lasts his Psyche does not decrease and the damage he sustains from enemy fire is reduced. However, when the ‘combat high’ ends, Snake’s body will crash leaving him very vulnerable for a while, so make the most of it while it lasts. 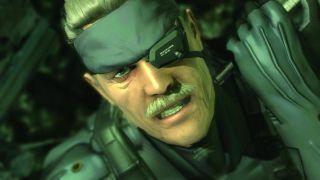 Snake’s Solid Eye enhanced vision system combines binoculars (Binos), night vision (NV), and normal settings, and is a lifesaver on more than one occasion (See the boss battle against Crying Wolf). When equipped it shows tags that reveal basic info on enemies, neutrals and friendlies, colour-coded red, gold and blue respectively. This can be particularly useful during the Middle East’s frenetic shootouts. It also highlights special items that you might otherwise miss. Night vision mode also reveals people’s footprints, enabling you to track enemies and allies. The threat ring is a clever device that replaces the earlier games’ Soliton Radar, depicting threats in Snake’s vicinity. This translucent ring encircles Snake while he lies down, crouches still or moves forward in a stealthy hunch. The circumference of the ring fluctuates depending on the relative location and size of a nearby threat. It’s a brilliant piece of design that’s worth its weight in gold. Be warned, though, when Snake is stressed the reliability of the Threat Ring drops, so keep your wits about you. This remotely controlled robot drone is new to MGS4 and an essential item if you’re planning on using stealth over brute force to ace the game. With its stealth camo enabled – press [X] to turn on – the Mk.II is invisible to all but infrared sensors. Since Snake can be attacked while he’s controlling the Mk.II it’s important for you to find rock-solid cover before you send the drone out. While the Mk.II has a limited range, and will drain its battery very quickly it can be used to scout new areas, stun guards with its electric tentacle – hold [L1] then press [R1], disable traps, toggle light switches and act as a decoy to draw guards away. MGS4 has the most refined stealth gameplay of any Metal Gear game so initially you may fall foul of its subtlety. Sound is of massive importance. If you can hear Snake’s footfalls (however faintly) then, potentially, so can the enemy. Even your equipment can give you away – the Solid Eye’s night vision mode makes a telltale hum, for example – so stay vigilant and use your ears. Equally, listening out for environmental clues given out by enemies pays dividends wherever you are. Entering a new area? Use the Mk.II to get the lie of the land and to identify potential threats. Find a good vantage point, get a good OctoCamo rating and just watch the world before you. This way, you reduce the risk of steaming into the path of enemies and having to ‘go loud’. Keep your tranq pistol equipped. Not only will it enable you to take down enemies silently (and non-lethally), but it also enables you to use Close Quarters Combat (CQC) moves on enemies to subdue them without raising the alarm. 1. Be sure you know whom you’re shooting at. All you have to do is clip a local militiaman with a round and the entire army will turn on you making your job twice as hard. If in doubt, equip the Solid Eye to bring up friend/ foe data. If you do indulge in a spot of friendly fire, you can make amends by taking down some of the enemy, but be quick. 2. Unless you’ve bought a heavy weapon (the Javelin missile, for example) from Drebin, try to avoid any direct confrontation with the Gekko Metal Gears. These biomechanical monstrosities are agile, fast and powerful, capable of scaling buildings, shooting you to pulp and delivering a roundhouse kick that will wipe away most of your health bar. If you must show how big your stones are, aim for the top of the Gekkos’ heads. Their living legs look like weak points but you’ll only cripple them temporarily. 3. Try flanking the enemy. The PMC mercs are nearly always fighting a knot of militiamen, so circle around and take out as many of the Praying Mantis soldiers as you can. You’ll know you’ve tipped the battle in your favour when a cheer goes up from the militia. 4. Don’t be ashamed to use the auto-aim function in the Haven Trooper battle. These ladies are very agile, and bounce all over the place, so being able to flip from one prancing assassin to another quickly makes a huge amount of sense. 5. Oh, and watch out for Claymore mines in the palace. There are several hidden around corners. If in doubt, crawl into an unseen area. Do this and you’ll pick up any Claymores you pass over rather than setting them off.